Don the Whale – From SpongePedia, the biggest SpongeBob-wiki in the world! Don the Whale is a very muscular killer whale who is seen hanging around Goo Lagoon with his workout friend, Larry the Lobster. Don the Whale sometimes hangs around the bar, listening to people talk about their workout routines. He has been in most of the episodes with Goo Lagoon in it, three of them are MuscleBob BuffPants, Ripped Pants and Texas. Don the Whale is not a lifeguard; he just hangs out at the beach, mainly staying at the weight lifting area and juice bar. Don is a bodybuilder and Anchor Competition joiner. He can lift anything heavy, but could only throw an anchor 210 yards. Don the Whale is a blue colored, buff orca. When he lifts weights, he has a massive, wide-open mouth with plain white teeth. He also wears blue swimming trunks, and has a 6-pack. In one episode someone says that Sandy is the only mammal in Bikini Bottom. But Pearl and Don the Whale are both also obviously mammals though she may have meant the only land mammal thats not a human diver who lives in Bikini Bottom. He is very muscular, because in most episodes you see him lifting weights. 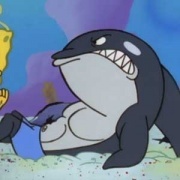 SpongeBob once attacked Don the Whale, because SpongeBob thought he was Sandy in the episode Texas. Don the Whale beat him up for that. He hosts the Bikini Bottom Jail chapter of Lights, Camera, Pants! Closed captioning said his name was Dome the whale. This page was last modified on 28 August 2017, at 10:28.